Cultivate the potential for deeper connection in every conversation. We often find ourselves distracted and overwhelmed by a constant stream of information and demand for connectivity. Now more than ever, we need to develop our capacity for greater presence in our daily lives and relationships. One of the best ways to do this is by improving the quality of our conversations. Dr. Diane Millis offers us inspirational stories, insights and spiritual practices from many faith traditions to increase our awareness of the deep, natural holiness waiting to be unlocked in our everyday encounters. Learn how to move beyond conventional topics to exploring purpose, meaning and values in conversation. What are you hoping to communicate to those who read your book? I would love to have my readers engage in conversations more contemplatively. Too many of our everyday conversations are conventional in nature. It’s as if we are performing a part and exchanging rehearsed lines. Such conversations can be really draining, as we don’t discover much about one another or ourselves. Conversation—The Sacred Art describes a contemplative way of being in conversation. Practicing a contemplative approach to conversation invites us to listen within as we listen to one another; to speak from the core of our being—from our heart—and to invite others to do the same. We can cultivate contemplation in our conversations by asking good questions. Rather than posing conventional questions such as “What do you do for a living?” we can offer contemplative questions, like “Where are you experiencing joy in your life these days?” Asking one another contemplative questions encourages us to listen within to the conversation in our hearts, to name what we most deeply value and seek in our lives. 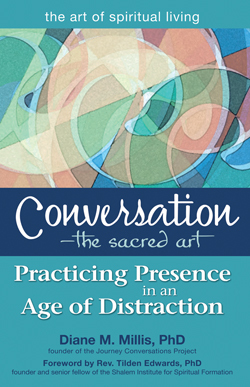 How does the subtitle of your book, “Practicing Presence in an Age of Distraction,” relate to conversation as a sacred art? I hear so many people lament that their daily lives consist of both too much and too little: too much information, too little meaning; too much connectivity, too little authentic connection; too much to do, too little time to slow down and be present. In an age where there may be fewer occasions for conversation, it’s imperative that we make the most of the time we do share. How much of my attention do I typically bring to conversations? Little to none, some, or all? How do I approach those with whom I converse? As objects, roles and categories, or as sacred beings made in the image and likeness of God? Where do I place my attention as I speak? On what I want to say or on what wants to be said through me? How do I listen? Do I concentrate on what I want to say next or listen with the ear of my heart to what is being revealed in others’ hearts? Relating with other persons can be really challenging. I aspire to bring my full attention to a conversation. I try to notice the spark of divinity within all persons. I strive to listen for what the Spirit of God may be conveying within me and through our exchange. It takes energy, it requires commitment, and I can’t do it on my own. That’s why I need to take time to pause and continually connect with the Spirit in the core of my being. In this book, I share some of the practices that help me attune my awareness to the presence of God. What motivates you to write about conversation and spiritual living? I subscribe to the Zen adage “what you most want to learn, teach.” I’ve taught in the fields of communication, family life, and spirituality because I have felt called to learn more about enriching relationships between persons, within families, and with God. After ten or more years of teaching communication and family studies, I felt stifled. I felt as if I was teaching techniques rather than preparing my students to encounter the mystery at work in our lives. I then felt a calling to turn my attention from teaching content and skills to facilitating processes for connecting with all that we hold sacred. It was at that point that I began training as a spiritual director. That was in the late 1990s. I would have never imagined at the time how quickly and dramatically our lives would change and how great the need would be for conversation. Practicing being present to one another and God has always been a challenge. However, the pace of our lives in the 21st century makes it all the more so. Our communication devices and online platforms offer so many ways of connecting. However, it saddens me to see more and more of us looking at our handheld devices than at one another. As a society, we need to decide how to put these resources to use with greater intention and care. Through my writing, I hope to restore the fundamental importance of conversation in our everyday lives and to encourage readers to create occasions for practicing this sacred art. When we reach our innermost heart we reach a realm where we are not only intimately at home with ourselves, but intimately united with others, all others. Centering: Begin each discussion with some time in shared silence. Sacred Reading: Ask a participant to read the given quotation one or more times. Pause in silence after the reading has ended. Storytelling: Invite one person to begin sharing his or her responses or wait until a person volunteers to do so. Allow each person time to respond to each of the questions without interruption. Compassionate Listening and Responding: After each person responds to the reflection questions, invite him or her to explore the theme further by asking contemplative questions. Pause: Take time to honor what has been shared before inviting another person to speak. What did you notice in today’s conversation? What stirred you or moved you deeply? What did you learn about yourself or others in today’s conversation? Some groups may also choose to conclude the conversation with a closing prayer. Whether or not a prayer is used, allow some time for shared silence. The facilitator may ring a chime to signal the close of the session. However, some participants may prefer to continue to sit in silence while others take leave. Add to the following set of conversation starters by bringing one or more of your favorite inspirational quotations to share with others in a future conversation. Always stay in your own movie. On a scale of one to ten (one being difficult and ten being easy), which number best describes how you feel about “staying in your own movie”? Talk about your reasons for selecting the number you did. What title best describes the movie you are currently in? If you could snap your fingers and cast yourself in a different movie, what would you name your feature film? Where would you be living? What would you be doing? With whom would you share your time? What does imagining this alternative movie show you about potential next scenes as you “stay in your own movie”? Can you recall a time in your life when joy simply happened to you? If so, tell a story about your experience. Have you ever chosen joy? If so, what did you do? How, if at all, would your life be different if you chose joy every day? If the only prayer we could say is “thank you,” that would be enough. Who are the persons in your life for whom you are especially thankful? To what extent have you been able to convey your gratitude to them? Select one person to whom you haven’t yet conveyed your gratitude. What did this person do for you and what have you learned from him or her? How might you create an occasion to thank the person for what he or she has contributed to your life? People try to get away from it all—to the country, to the beach, to the mountains. You always wish you could too. Which is idiotic: you can get away from it anytime you like. By going within. Nowhere you can go is more peaceful—more free of interruptions—than your own soul.... Renew yourself. But keep it brief and basic. A quick visit should be enough to ward off all ... and send you back ready to face what awaits you. When do you most want to escape your life? Have you ever experienced getting away from it all by going within? What helps you or hinders you from going within? Tell a story about a time in your life when you exercised the freedom to choose your attitude in a difficult set of circumstances. Who was involved? What happened? What did you learn from this experience? Who in your life has exercised the freedom to choose his or her attitude in a difficult set of circumstances? What have you learned from the person? The new culture is created by those people who are not afraid to be insecure. Tell a story about a time in your life when you experienced insecurity. What action would you take in your life right now if you could do so with full awareness of your insecurity(ies)? Our goal should be to live life in radical amazement ... [to]get up in the morning and look at the world in a way that takes nothing for granted. Everything is phenomenal; everything is incredible; never treat life casually. To be spiritual is to be amazed. What are you finding most incredible and phenomenal in your life at this time? What, if anything, do you take for granted? What single change could you make in your life to live it with a greater sense of amazement? Tell a story about a time in your life when you experienced dying to your own needs in order to more fully respond to others’ needs. Who was involved? What happened? What helps you die to, or let go of, your own concerns, ambitions, and need for control? You must always keep in mind that a path is only a path: If you feel you should not follow it, you must not stay with it under any conditions. To have such clarity you must lead a disciplined life. Only then will you know that any path is only a path, and there is no affront, to oneself or to others, in dropping it if that is what your heart tells you do to. But your decision to keep on the path or leave it must be free of fear or ambition ... look at every path closely and deliberately. Try it as many times as you think necessary. What is your path at this time in your life? What paths have you dropped because your heart told you to do so? What helps or will help you look at a path deliberately?